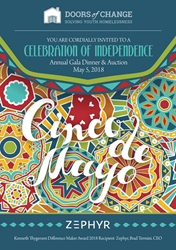 Doors of Change (DoC) will host its Annual Gala, “A Celebration of Independence”, on Saturday, May 5th, from 6pm – 10:00pm at The Carlsbad Sheraton Resort & Spa, 5480 Grand Pacific Drive, Carlsbad, CA 92008. This Cinco de Mayo-themed evening will include top-notch silent and live auctions, an open bar, a delicious dinner, live music, and the opportunity to hear from the youth served by Doors of Change. KUSI’s Dan Plante will once again be our host for the evening. The Ken Thygerson Difference-Maker Award will be presented this year to Zephyr, and its CEO Brad Termini, for its years of dedicated commitment to Doors of Change, and to the cause of youth homelessness in San Diego. The proceeds of this spectacular event will ensure the strength and expansion of our innovative community music and arts programs, which serve 450 youth per year, connecting them to critical resources in the community. Your attendance at this event will touch you deeply, and will, very literally, save lives. Tickets and sponsorships are available now, with early-bird pricing extending through March 4th. Individual tickets begin at $250.00, and sponsorships begin at $3100.00. To register, please go to http://www.DoorsOfChange.org, or contact Debbie Rodriguez, at Debbie@DoorsOfChange.org. Since 2001, Doors of Change (formerly known as Photocharity) has been working to alleviate youth homelessness in San Diego County, by offering community-based arts programming, outreach, and case management services.